Despite being well studied, Earth's closest neighbor remains an enigma. Over the New Year's weekend, a pair of spacecraft the size of washing machines are set to enter orbit around it in the latest lunar mission. Their job is to measure the uneven gravity field and determine what lies beneath - straight down to the core. The nail-biting part is yet to come. On New Year's Eve, one of the Grail probes - short for Gravity Recovery and Interior Laboratory - will fire its engine to slow down so that it could be captured into orbit. This move will be repeated by the other the following day. Engineers said the chances of the probes overshooting are slim since their trajectories have been precise. Getting struck by a cosmic ray may prevent the completion of the engine burn and they won't get boosted into the right orbit. "I know I'm going to be nervous. I'm definitely a worrywart," said project manager David Lehman of NASA's Jet Propulsion Laboratory, which manages the $496 million, three-month mission. Once in orbit, the spacecraft will spend the next two months flying in formation and chasing one another around the moon until they are about 35 miles above the surface with an average separation of 124 miles. Data collection won't begin until March. 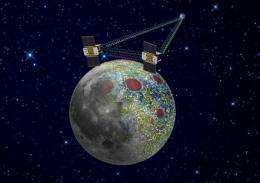 Using the gravity information, scientists can deduce what's below or at the lunar surface such as mountains and craters and may help explain why the far side of the moon is more rugged than the side that faces Earth. Scientists expect the mission to yield a bounty of new information about the moon, but don't count on the U.S. sending astronauts back anytime soon. The Constellation program was canceled last year by President Barack Obama, who favors landing on an asteroid as a stepping stone to Mars. The near side of the moon would be shielded from "some" meteors by the Earth since it is gravitationally locked, therefore mostly smooth. Can I have your salary now? "Meteors" and "asteroids" are the same thing, idiot. Well, put this way, a "meteoroid" is any "asteroid" or "comet" that actually hits something. Earth's gravity is 6 times more than the moon, and it's cross section is 13 times more than the moon. An Lunar eclipse proves you wrong, since the shadow of the Earth entirely blocks the sun light on the Moon, proving that the Earth would block all "straight line" ballistic objects from hitting the moon, AND having much stronger gravity, it will even capture "some" of the objects that would have come in on slightly arcing paths. Lunar eclipse proves you wrong. So, since the moon is tidally locked, when the meteors come from a Moon-side direction, they naturally hit the far side of the moon, cratering it up badly. When the meteors come from the Earth-side, then they hit the Earth, many burning up in the atmosphere, and so the near-side of the moon is not hit as often. This isn't rocket science, it's obvious to anyone who can think for themself. Oh yeah, if you're too slow to figure out the Earth could shield some ballistics, go get some balls and place them at distances, and try to hit the second one by throwing a rock THROUGH the first one. You think a tree need be as big as the horizon to stop a bullet? No, not at all. Earth shields the near side of the moon, and the far side of the moon shields Earth. This is what's wrong with "science" in the world today. These bozos can't even figure out stuff that's piss easy. I thought everyone knew this kind of baby stuff, because it's pathetically obvious. a meteor is a non-terrestrial object that has entered earth's atmosphere. on successful impact it is a meteorite. does the rather narrow field of interference in nearly straight-line object trajectories account for the differences found between the near-side and far-side? I don't know, but I doubt it. perhaps, nanobanano, you should dial down the arrogance and do the math. load your mind before you shoot your mouth, idiot. Very interesting! I'm puzzled by the necessity of using two satellites rather than just one, like GOCE here on Earth. As far as I know GOCE has worked admirably, and with the thinner lunar atmosphere drag should be even less of a problem than it is for GOCE. Perhaps this is just the less expensive/more robust option? Nano - Pathetically obvious unless you do the math. Learn about solid angles and see how well the earth "shields" the moon. Since a sphere (the entire sky around the moon) is 12.566 Sr (4pi), the earth "shields" 0.003215/12.566 = 0.0256% of the sky as seen from the moon. Some bozos can't even do the basic math and troll around on science sites. Pathetically obvious that you have no concept of basic geometry or the distances involved in astronomy. It's also pathetically obvious that heavier objects fall faster than lighter ones, that the pressure exerted by a column of liquid depends on both its height and its diameter, that all dinosaurs were lumbering cold-blooded beasts, that an object in motion will eventually come to rest, and that if you accelerate long enough you'll eventually go faster than light. Rationalism's a nice first step, but it just doesn't work as a way of figuring out the universe. You have to employ empiricism to stand a chance of figuring anything out, and that's what these researchers are doing. Deciding that something is "pathetically obvious" and coming to a halt right there won't cut it. a pair of spacecraft the size of washing machines are set to measure the Moon's uneven gravity field and determine what lies beneath - straight down to the core. Thanks, Alicia, for this report on measurements to determine what lies beneath the Moon's surface - "straight down to the core." Or if the Sun is a stable heat source and man-made CO2 (AGW) causes climate change. I believe you're right about it being the more cost effective option. Here is a link on GRACE. The Earth only shields a miniscule part of the sky of the near side. This cannot account for the vast difference in landscape. The gravity effect also does not account for a difference in the number of impacting objects. E.g. Not long ago it was thought that Jupiter (and to a lesser extent Saturn) would 'protect' the Earth by gravitationally pulling in comets and the like. But simulations show that their gravity fields steer as many towards us as they deflects or catch. I'm puzzled by the necessity of using two satellites rather than just one, like GOCE here on Earth. It's a different setup. GOCE has about ten times the mass of each of these sattelites, so it would probably have been too expensve to get something like it to the Moon. GRAIL has the advantage of being able to fly in very low orbit, though (about 50km high) which should give excellent data. It looks naturally, but there are another explanations. For example, the Moon was hit with large body, which melted portion of its surface. http://www.viewsi...-reports The gravity field spaceprobes could help distinguish between these two models. The probes were launched in September and they're just getting there now? It took the Apollo missions four days. Why is it taking so much longer for these probes? Why is it taking so much longer for these probes? Because they were on a low fuel trajectory via L1. It's not like we have to get these things there as fast as possible. Saving fuel (and thereby increasing payload) is better than getting there a few days earlier. With the Apollo missions time was precious. A low fuel approach would have saved some weight - but that would have been more than eaten up (literally) by the additional food, water and air (and fuel for heating) they would have to have taken with them. So getting them there on a more direct route was preferrable. That explains the ~265 Bohr-Wheeler mass parabolas. Maybe the public will finally get some high res pics of the lunar surface from these cameras. Anyone know the resolution or specs of the cameras? Nanobanano is an idiot, well done taking the time to show him. Maybe the public will finally get some high res pics of the lunar surface from these cameras. From the size of them (and the types of pictures they provide) I think they will not deliver higher resolution images than what is already available (though I couldn't find any detailed specs). They're aimed at student/classroom participation. i still cant decide if nano is the walter of science, the o'reilly factor of science or the two grumpy old muppetmen of science? 3. Oh boy. That requires years of additional study. I give up. 4. Dunning Kruger Effect - Now I understand how it applies to me. 3. the collision that excavated a 2,500km-wide crater at the lunar south pole, one of the biggest in the solar system. Children learn that Earth shielding is the cause .. The far side of the Moon has lots of craters because it faces open space. The side of the Moon facing Earth has fewer craters. Thats because our planet protects it from falling space debris.